I don't think my floors have ever looked this clean! We’ve done a few renovating projects on our home in the past several years, including putting in wood flooring in the main room and tile flooring in the kitchen and laundry room. And while I dream about someday overhauling the master and guest bathrooms, at this point they still have the linoleum flooring that was there when we moved in. It’s not an eyesore or anything, so I don’t have too much of an issue with it. However – I did have an issue with the fact that it was seemingly impossible to get those floors completely clean. The linoleum flooring is not completely smooth, so dirt and grime get ground into those nooks and crannies. Even vigorous mopping was not enough to lift the stubborn dirt in my linoleum floors! But I recently had a moment of inspiration that enabled me to finally (FINALLY) get the ground-in dirt out of the linoleum floors in my bathroom. So I gave it a try, and it worked like a charm! Here’s how you can do it on your own grimy floors. 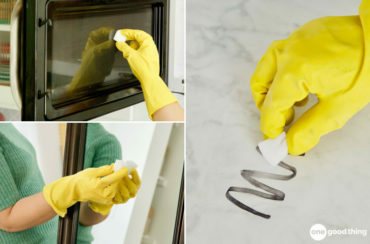 Start by plugging in your iron near the area you’ll be cleaning. Next, mix together one part ammonia with one part hot water. Dunk a clean washcloth into the ammonia solution and wring it out a bit. You want it to be damp, but not dripping. Lay the wet cloth out on the area you wish to clean, then place your hot iron on the towel. (It will get steamy, so be careful!) Move the iron around constantly for about 30 seconds or so, then check the underside of the towel to see if the dirt is lifting out. I would like an idea about how to PREVENT this sort of porous craggy linoleum from taking in so much dirt in the first place. With dogs and people tramping in dirt daily, it’s not possible to do this kind of cleaning as often as it needs. Does anyone know of a permanent sealer of any kind to apply over this difficult flooring? Why are your stains in a perfect pitch and identical across the 3 sets of tile in the before pic? I assume this was photoshopped. What about white vinegar? Any reason why it wouldn’t work? I’m trying to not use any cleaners with chemicals any more. It won’t work quite as well, but vinegar should definitely help! I don’t have ammonia. I would only buy it for this project. Do you think bleech or white vinegar would work just as well? Be careful! Hot iron and ammonia can hurt your eyes, lungs, etc. You won’t be able to breathe! As a retired military wife, we used ammonia a lot cleaning our quarters I would never have mixed it 1/2 & 1/2 and never would I have used an iron on a cloth wet from the mixture. Read the bottle! I cannot wait to try this new method with the iron at home! What an idea! I just tried this method. I have never cleaned with ammonia and was not quite prepared for the very very strong fumes. The warnings on the ammonia bottle are strong and to follow. I was trying to clean my 1/2 bath and connecting small laundry room and had to stop during it because of orders. Be careful. Did you use the ammonia too? I agree, this is not laminate. On my laminate flooring I use a Shark steam cleaner and it works really well. I had the same problem from Mop and Glow – waxing over a floor that wasn’t really clean. I opened the house windows, turned on our whole-house fan and used straight lemon scented ammonia with a regular mop. Amazing. Smelly, but amazing.